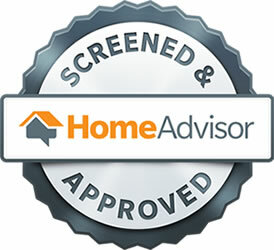 We have Multiple Options with LIFETIME TRANSFERABLE WARRANTIES! 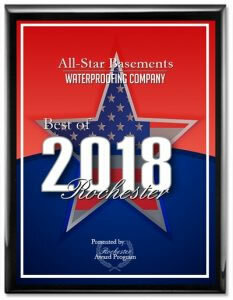 Our All-Star Sump Pump Systems are top of the line. 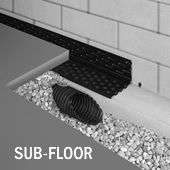 We also have a variety of sub-floor systems, an above floor system, sealants and more! 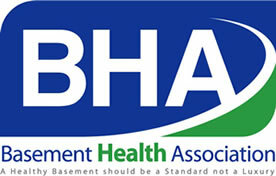 Collects water from all areas – walls, footing/footing/wall join, and under the floor. Our Drain-Eze Drain Tile System is a great option for water issues of all kinds, especially larger water problems. Drain-Eze collects water seepage from the walls and footer, along with any seepage through faults in the foundation. The water is then channeled directly into the Drain Tile and sloped to the Sump Pump System. 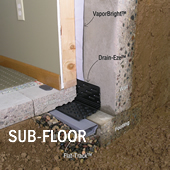 Drain Main design integrates the reliable baseboard style system with the tried-and-true subfloor tile system. Drain Main’s open back will not restrict water flow, instead water is collected for the full length of the system. The Open Back never restricts the primary water source. The Drain Main System is then channeled to the Sump Pump System. Flat-Track System is an ideal remedy to all your water management needs. This unique and innovative design collects water from the two primary sources that are responsible for your basement water leakage. Drain-Eze collects water seepage from the walls and footer, along with any seepage through faults in the foundation. The water is then channeled directly into the Flat-Track. Unlike large holes, narrow slits throughout the main sections prevent large solids from entering the System. Umbrella-like sidewalls prevent dirt from compacting against the sides of the System. This unique high flow design is capable of handling the most severe water problems. Service Ports are installed along main runs for easy access to the System. The Flat-Track System is then channeled to the Sump Pump System. Water X-Tract™ is ideal for poured or block wall foundations. 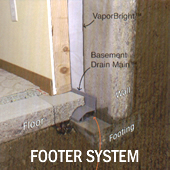 This system is not submerged in soil, which can plug traditional subfloor waterproofing systems. Hollow baseboards adhere to the floor along the wall acting as a barrier. The system collects water from the weep holes tapped into the blocks where the floor and walls meet. 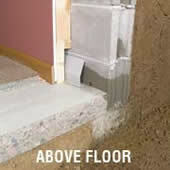 The water travels along the hollow baseboards to the sump pump leaving your basement clean and dry. The Water X-Tract System is then channeled to the Sump Pump System. Bubbler pot and Debris/Ice Filter are designed to take discharge line water and /or downspout water underground away from your home’s foundation. 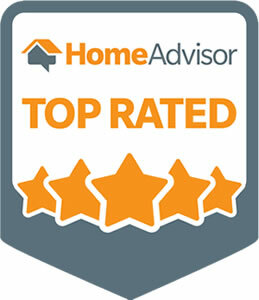 WaterTite Paint is a Mildew and Mold Proof sealant for your walls. Oxy-Mold MX-501 is an EPA registered fugicide and disinfectant concentrate that kills all species of mold on all types of surfaces.